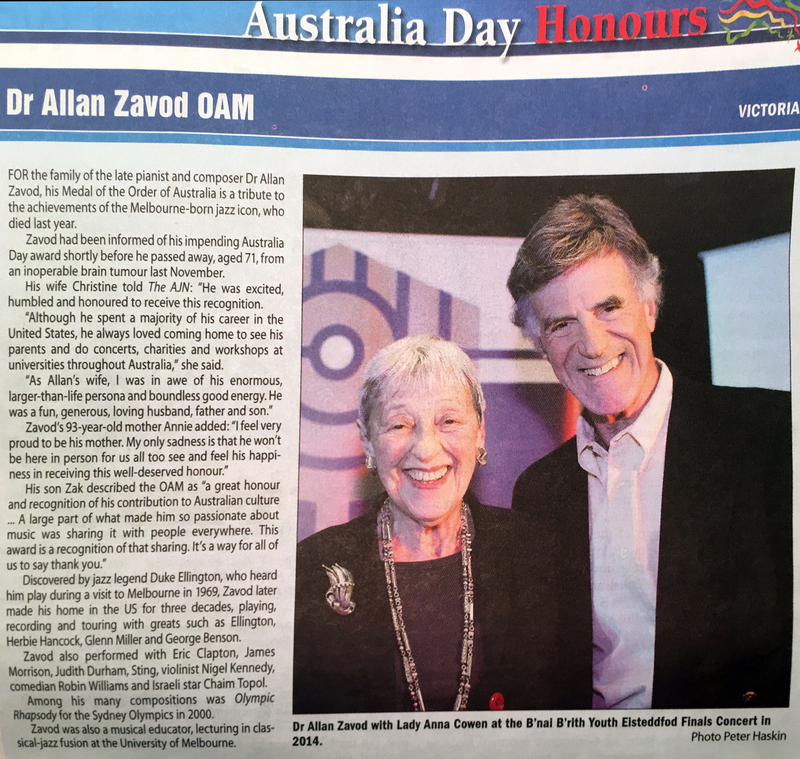 OAM Award coming soon: Dr. Allan Zavod DMus: Composer, Conductor, Arranger, Educator, Performer: World famous Jazz Solo Pianist. For the family of the late pianist and composer Dr Allan Zavod, his Medal of the Order of Australia is a tribute to the achievements of the Melbourne-born jazz icon, who died last year. Zavod had been informed of his impending Australia Day award shortly before he passed away, aged 69, from an inoperable brain tumour last November. His wife Christine told the AJN: "He was excited, humbled and honoured to receive this recognition. "Although he spent a majority of his career in the United States, he always loved coming home to see his parents and do concerts, charities and workshops at universities throughout Australia," she said. "As Allan's wife, I was in awe of his enormous larger-than-life persona and boundless good energy. He was a fun, generous, loving husband, father and son." Zavod's 93-year-old mother Annie added: "I feel very proud to be his mother. My only sadness is that he won't be here in person for us all to see and feel his happiness in receiving this well-deserved honour." His son Zak described the OAM as "a great honour and recognition of his contribution to Australian culture... A large part of what made him so passionate about music was sharing it with people everywhere. This award is a recognition of that sharing. It's a way for all of us to say thank you." Discovered by jazz legend Duke Ellington, who heard him play during a visit to Melbourne in 1969, Zavod later made his home in the US for three decades, playing, recording and touring with greats such as Ellington, Herbie Hancock, Glenn Miller and George Benson. Zavod also performed with Eric Clapton, James Morrison, Judith Durham, Sting, violinist Nigel Kennedy, comedian Robin Williams and Israeli star Chaim Topol. Among his many compositions was Olympic Rhapsody for the Sydney Olympics in 2000. Zavod was also a musical educator, lecturing in classical-jazz fusion at the University of Melbourne. Writer, Australian Musician Magazine, 'for 15 years'.